Own Vera Series 5 DVD from Deff, DVD, Blu-Ray & 4K Video Specialists - Free UK Delivery..
Own Vera Series 1 to 5 DVD from Deff, DVD, Blu-Ray & 4K Video Specialists - Free UK Delivery..
Own Vera Series 1 to 8 DVD from Deff, DVD, Blu-Ray & 4K Video Specialists - Free UK Delivery..
All the episodes from the first nine series of the ITV crime thriller based on the novels by Ann Cleeves. 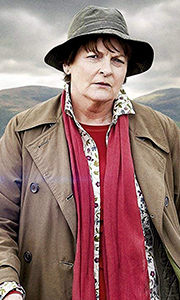 Detective Chief Inspector Vera Stanhope (Brenda Blethyn) along with Detective Sergeant Joe Ashworth (David Leon) and their team, carry out various murder investigations. Series 1 episodes are: 'Hidden Depths', 'Telling Tales', 'The Crow Trap' and 'Little Lazarus'. Series 2 episodes are: 'The Ghost Position', 'Silent Voices', 'A Cert..
Own Vera Series 2 DVD from Deff, DVD, Blu-Ray & 4K Video Specialists - Free UK Delivery..
Own Vera Series 3 DVD from Deff, DVD, Blu-Ray & 4K Video Specialists - Free UK Delivery.. The indomitable DCI Vera Stanhope, assisted by her trusted colleague, DS Joe Ashworth, steps up for another series of challenging cases. She investigates the mysterious death of a pensioner on a busy commuter train (On Harbour Street), unearths a thirty year mystery after a brutal murder on the sands of a seaside resort (Protected), unpicks the tragic last months of a failed novelist gunned down on a remote Northumberland moor (The Deer..
Set amid the wild beauty of the Northumberland landscape, DCI Vera Stanhope investigates chilling crimes only she can solve. The shambolic but perceptive detective does not make friends easily. Grumpy and often short-tempered, what Vera lacks in charm she makes up for in wisdom and insight. In the sixth series, Vera and her team are called into action to tackle a number of challenging cases; from unravelling the mystery of a woman found..
Own Vera Series 7 DVD from Deff, DVD, Blu-Ray & 4K Video Specialists - Free UK Delivery..
Own Vera Series 8 DVD from Deff, DVD, Blu-Ray & 4K Video Specialists - Free UK Delivery..
All four episodes from the ninth series of the ITV crime thriller based on the novels by Ann Cleeves. Detective Chief Inspector Vera Stanhope (Brenda Blethyn) along with Detective Sergeant Aiden Healy (Kenny Doughty) and their team, carry out various murder investigations. In this series, Vera's personal life becomes turbulent following her father's death and one of her old associates is found murdered. The episodes are: 'Blind Spot', '..